The next generation of Breast Cancer Awareness campaigns are moving well past awareness to focusing on other aspects of fighting the disease. The Komen Columbus Race for the Cure. (Image via Facebook). Each October, items from soup cans to football cleats to profile photos turn pink for Breast Cancer Awareness Month. Brands follow suit with pink-themed products and pledges to donate money to breast-cancer research. However, many brands are realizing pink campaigns are a dime a dozen and looking for new ways to get the attention and support of consumers to fight breast cancer. "You’ve got to do more than have a pink ribbon. That's really just dipping your toe in the water," says Bonnie Ulman, chief insights and planning officer at M Booth. Consumers are looking for more than awareness, according to a study by M Booth on Breast Cancer Awareness Month. They want new information, including research breakthroughs, better engagement for survivors and their families, or a specific call to action to support those battling the disease, Ulman says. According to the study, 96% of people want to learn more about breast cancer. Some brands are updating their breast-cancer efforts to stand out from the crowd. Case in point: perhaps the best-known breast-cancer organization, Susan G. Komen, named this year’s October campaign More than Pink. "We thought it was time for people to take a different look at breast cancer," says Andrea Rader, MD of communications at the organization. Ultimately, Komen wants to reduce U.S. breast-cancer deaths by 50% over the next decade. Its campaign features real stories from survivors, their families and friends, and caregivers. "We want to acknowledge all these people: the scientists, communities, caregivers," Rader says. "We want people to understand there's help for them if they need it. 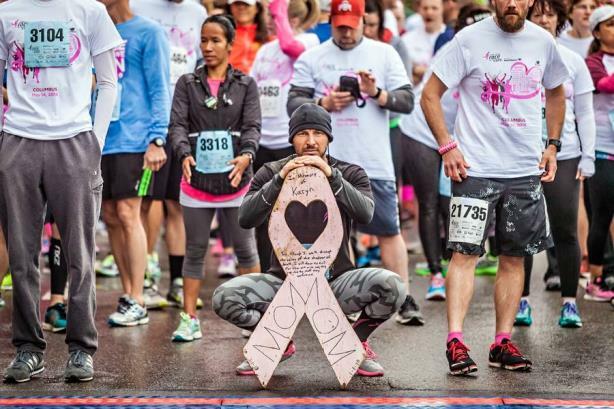 An organization like Komen is there for them and doing the hard work that needs to be done to help them, their daughters, and future generations." Rader adds awareness is no longer Komen’s focus; its audience has moved past that point. "People are looking for how you are backing this up," she says. "People get awareness, and we wanted to let people know that what we're talking about is a real concerted, aggressive effort to take on the latest challenges in breast cancer." Another hurdle for Breast Cancer Awareness Month campaigns is the color pink itself, which also inspired the name of Komen’s campaign. "There is a sense that because the breast-cancer movement is pink that it is not serious or fluffy," she explains. "We wanted to convey the seriousness with which we take this mission and add a gravitas to the work we do." An estimated 300,000 U.S. women will be diagnosed with breast cancer in 2016, according to the American Cancer Society. However, organizations bring in hundreds of millions of dollars to fight the disease. Last year, Komen raised $242 million and the National Institutes of Health dedicated $674 million to breast-cancer research. One brand taking a new route with its breast-cancer awareness campaign is Weight Watchers, which launched its Project L.I.F.T. push this year. Rather than focusing on raising awareness, the company is talking about what happens after the disease. "We were thinking about how we could support the breast-cancer community in a way more meaningful and authentic for us than merely going pink," says Stacie Sherer, VP of public relations at Weight Watchers. "We found that people were likely to gain weight both during and after treatment, and the weight gain associated with breast cancer was not talked about. With that insight, we’re trying to carve our unique space for Weight Watchers to be part of the conversation." Rather than just adopting a pink ribbon, Weight Watchers is tailoring its campaign to its audience and offering support to help women lose weight after cancer treatment. "Weight can have an impact on your risk of developing cancer and play a role in survivorship," Sherer notes. "We wanted to play a role in bringing survivors a community to support and guide them as they work to reclaim their body and life after treatment." While Weight Watchers has no direct connection to breast cancer, the company is taking its core concept – losing weight – and applying it to its campaign. "When brands decide to engage, they have to do it in a way that is both true to their brand DNA and very transparent to consumers," Ulman says. "Brands need to be willing to engage in dialogue with consumers." Adopting the pink ribbon isn’t a bad thing – Ulman calls it "a great first step" – but consumers will appreciate brands going beyond the symbol. "You have to start somewhere as a brand," she explains. "The pink ribbon is an iconic symbol of the breast-cancer-awareness movement. Consumers still have very positive feelings about the pink ribbon. We as an industry are often eager to keep things fresh, and in this case, there is a landmark identity for the movement that is really important to consumers."